The Seattle International Film Festival will be showing a series of High-Definition opera and ballet transmissions at their home theater, SIFF Cinema, which also happens to be the theater in McCaw Hall where we host Seattle Opera's pre-performance lectures and post-performance Q&As. For a complete schedule of the SIFF "Command Performances in HD", go to SIFF OPERA SCHEDULE. 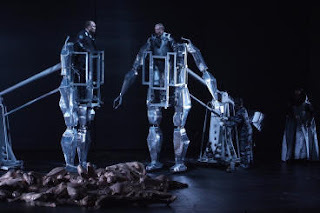 The series gets going tomorrow, with a screening of the new Das Rheingold from Valencia's Palau de les Arts 'Reina Sofia,' in what sounds like an intriguing production by Spanish theater group La Fura dels Baus. (Above, what I'm guessing are Fasolt and Fafner from their Das Rheingold.) Valencia's Ring is still being created (the Götterdämmerung is to be produced this summer), but it's garnered plenty of interest so far: check out Mark Swed's review of this screening at LA TIMES. There's also promotional material about the show at EMERGING PICTURES. I have a wonderful book to recommend to you, "WAGNER WITHOUT FEAR" by William Berger! Thanks for the recommendation! I may not need it though--I was really amazed after watching that version of DR at Siff. I think the regie aspect (beautiful in an SF sort of way, as you say) made it really compelling. It was much more dramatic than I thought it would be. And you should see a DR where the characters can approach within five feet of each other and relate as human beings, instead of one where each is locked in his or her own car.